Living in a world where personal computers come in human form, people begin to lose their touch with each other, but college student-to-be Motosuwa Hideki stumbled upon something more than he could hope for - a cute PC named Chii! It is always a pleasure for otakus to see things change for the better, improvements made by publishers and domestic distributors that they have been wanting to see. And through the publication of one of the most desired manga series among fans, TOKYOPOP is certainly taking a step toward the right direction, to publish manga the way it should've been done years ago. With the booming amount of unauthorized fan-made translation circulating through the information superhighway in this new age, it had become more important than ever for domestic publishers to pick the right fight, by picking the right series to translate and release in the domestic market, picking something that will have the strength to stand up to challenges... and for these companies to do a good job by adapting a format that otakus will accept is just as important as anything else. Having read both the original import version of Chobits and the domestic version released by TOKYOPOP, it is safe to say that TOKYOPOP without a doubt did one of the best domestic releases for a manga that I've seen in the US market. The first element of this is the 'right to left' book design, which allows otakus in the US to get a feel of what the original manga is like. Secondly, all of the artwork was published just the way it was in the original version, even with many of the 'sound effects' in the background (in Japanese manga, sounds made by characters or their surrounding areas are often represented by phrases like what *yawn* would be in US comics) left the way it originally was, in Japanese. One of the most interesting extras was the background information printed on the inside of the back cover of the book on CLAMP. It certainly provides some interesting reading for fans that are unfamiliar with the group. 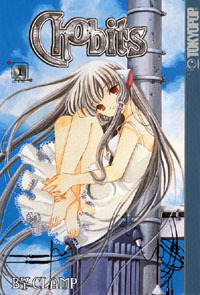 Chobits is a story that takes place in a world where personal computers are all in human forms as cute, attractive girls and handsome guys. It is a world where the relationship between human beings are being challenged as the bond between PCs and their owners begin to grow beyond the old boundary between humans and machines. As a college student-to-be who is going through prep school who knows nothing about computers, at first Motosuwa Hideki doesn't seem to fit into such a world. That was until he found an adorable PC at a garbage drop-off site late one evening - Chii, a girl/PC that is going to change his life. Just like most of CLAMP's previous manga series, Chobits offers a great dose of romance comedy for their fans, plus a healthy amount of life experience teachings between lines. One of the minor places where improvement could be made besides some of the slightly incorrect translations, was that although leaving original Japanese 'sound effect' and some background phrases as they were certainly made the manga more interesting, but it would make it that much better if these phrases can be left as they were WITH additional side notes printed next to or below the square explaining what those sounds were. An example would be when Hideki clapped his hands the "Pachi Pachi" phrases shown in the square can be printed near the square in both Japanese and English (as 'Pachi Pachi') with a short note stating what these sounds meant. In this case, they are the sound of hands clapping, of course. It is always the collection of all the small steps we take that bring us forward, and with the domestic publication of Chobits, it's certainly helping the US market to take a steady step toward a future where otakus in the US can enjoy more quality translated products without breaking the bank accounts.